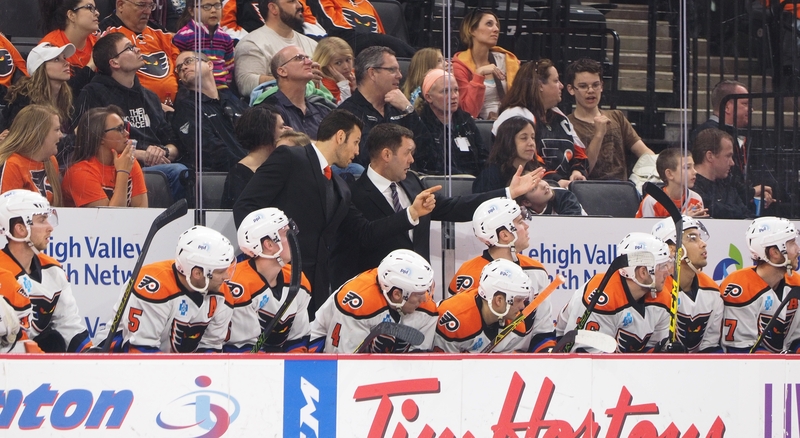 The Lehigh Valley Phantoms will have a new face behind the bench alongside head coach Scott Gordon and assistant coach Riley Cote this upcoming season. Kerry Huffman, a former Philadelphia Flyers defenseman in the late 1980’s, will be joining the staff for the 2016-17 season. Huffman brings 401 NHL games of experience and countless experiences from his 13-year playing career to a young Phantoms core of talented defense prospects. He retired from pro hockey back in 1999, and after 17 years is returning to hockey at the pro level from a different perspective. From there, a friend of Huffman’s had been coaching a junior hockey program in the United States based an hour north of the Lehigh Valley in Wilkes-Barre, Pa. (the Wilkes-Barre/Scranton Knights) and asked if he would be interested in helping out at practice. While Huffman attended a few Phantoms’ games at the PPL Center last spring, it wasn’t until he met with Philadelphia Flyers GM Ron Hextall after the season had ended that he began to think returning to pro hockey in a coaching capacity was a realistic opportunity. Huffman and Hextall have known each other for over 30 years. Huffman was drafted 20th overall in the 1st round of the 1986 NHL Draft and Hextall was a 6th round pick of Philadelphia in 1982. As a former NHL defenseman, Huffman said his role is going to predominantly be working with the defense. He’s spent some time with Scott Gordon and talked with Riley Cote quite a bit already, and is hoping he will be a perfect fit on the Phantoms’ staff. “[I went] through the process a long time ago, but playing as an 18 and 19 year old hopefully I can relate some of my experiences to those guys and try to keep them level-headed,” Huffman said. “I’m really looking forward to that. I have kept up with what they’ve been doing drafting these young kids. It’s an exciting group for sure,” he added when asked about the prospect of coaching potential stars in the making like Travis Sanheim, Sam Morin and Robert Hagg in the fall. Above all, Huffman is hoping to bring a winning attitude and a sharp development curve to the Lehigh Valley in the fall. You can follow all the latest Lehigh Valley Phantoms breaking news, updates and much more during the offseason by following Tony on Twitter -> @TonyAndrock and by visiting his daily online coverage of the AHL at Highland Park Hockey.